Japan based design studio, nendo has welcomed the new year with two latest home products. Mobile-cushion: a cushion made of multiple types of fabric sewn together in patchwork style. Two sections of the fabric each provide a pair of slots that can be used to secure a smartphone or tablet PC. 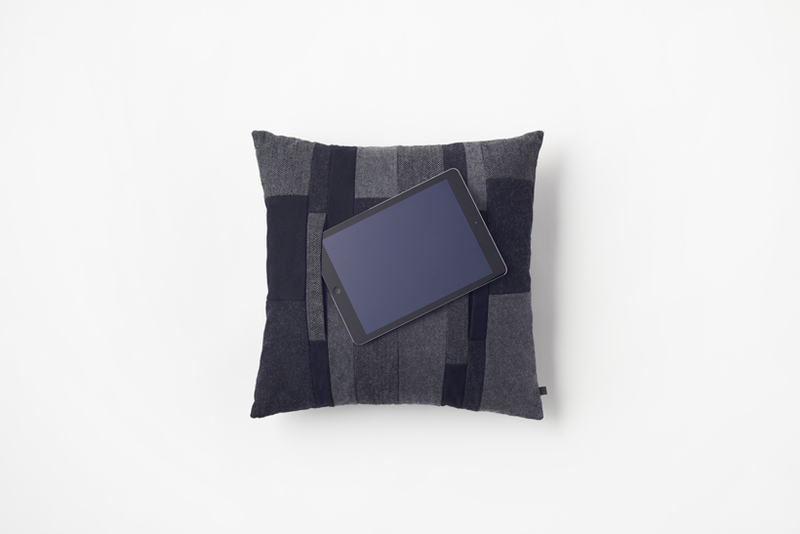 The cushion is designed for our modern lifestyle, where the use of mobile devices is becoming more common as compared to TVs or computers. The device slots hidden in the cushion make it easy to view the screen while relaxing on the sofa or bed, or the cushion can be placed on one’s lap to make use of the tablet keyboard more comfortable when sitting up. 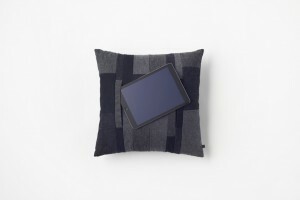 When used as a normal cushion, the device slots are obscured by the patchwork design of the fabric. 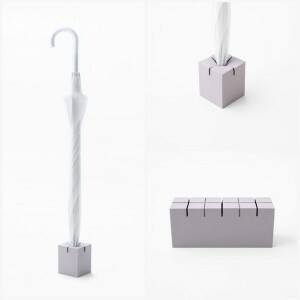 The umbrella stand – meji – uses grooves instead of holes, giving it a clean and simple appearance. The design’s motif takes inspiration from the joints of a tiled floor. When an umbrella is set into the grooves, the product becomes an umbrella stand. Pressing the spike of an umbrella into the centre of the cube keeps it held vertically in place. A typical umbrella stand looks either like a huge container or a box full of holes, and mostly seems out of place when not holding any umbrellas. meji reduces the undue space taken up by traditional umbrella stands. It doesn’t look out of place even when not in use, and maintains a neat appearance even when multiple stands are lined up in an entryway. The stand is made using a dense resin known as Polystone. This is then covered with silicone, which offers excellent pliability and durability. Options include a single-umbrella stand and a three-umbrella stand, each available in five colours.